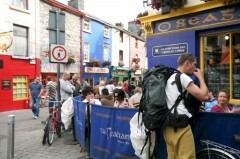 Galway lends itself to walking, the city centre is compact and it is always lively and a pleasure to be in. There are also excellent shops, especially craft shops, which make window shopping and browsing an essential part of any walk here. 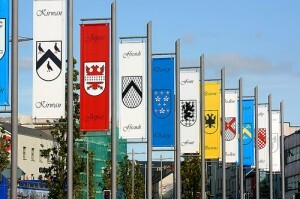 Galway is still known today as the City of the Tribes, the name referring to 14 important Anglo-Norman merchant families who lived there and dominated the life and trade of the city during the middle ages. The families were: Athy, Blake, Bodkin, Browne, D’Arcy, Deane, Ffont, Ffrench, Joyes, Kirwan, Lynch, Martin, Morris and Skerrett. From 1232 when Richard de Burgo drove out the ruling Gaelic O’Flaherty’s, until the end of the 1600’s Galway flourished as a centre of trade. During the 15th and 16th centuries ships from Spain, France, the Carribean and South America crowded its harbour and the town was a wealthy one. It all went wrong in 1692. The city gave its support to James II in the English Civil War. He lost. When the victorious William of Orange sent his forces to ‘restore religion and liberty’ in Ireland Galway was firmly in his sights. The city was taken, its families relieved of their power and influence and the city sank into an economic depression from which it only truly emerged in the latter half of the 20th century. This is the centre of Galway and the pivot around which the city moves. 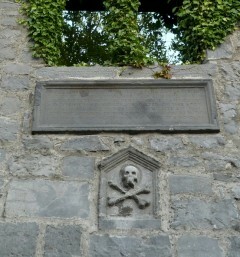 The land here was given to the city 1710 by Edward Eyre, then mayor of Galway. In 1965, the square was officially renamed “Kennedy Memorial Park” and there is a bust of J.F. Kennedy in the park. The square underwent quite radical change in the early years of this century, a process that was not without its controversies. In truth any change to a place with such a central part in the life of a city would have been controversial and overall the outcome has been better than expected. There is often something going on in Eyre Square, perhaps some street performance as part of a festival, maybe an open air concert or possibly a protest about some controversial issue. There are plenty of places to sit for a few minutes and get a feel for the life and hum of the city. It’s worth dropping into the Tourist Office here to pick up information about what’s on (there is always something on in Galway!). The Eyre Square Shopping Centre, a modern mall, may be of interest for picking up some souvenirs. Lynch’s Castle was once home to an important family, one of the tribes, who supplied the city with more than 80 mayors between the 15th and 17th centuries. 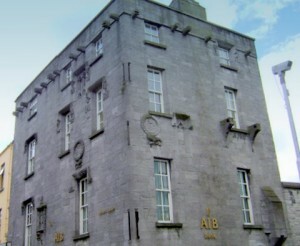 It now houses a branch of the AIB bank. The castle dates to the early 1300’s, though the current building was mostly built in 1503 following a catastrophic fire some years previously. 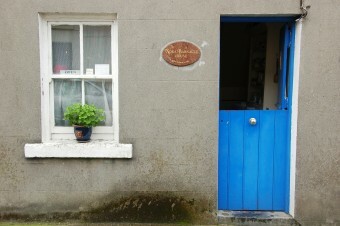 It has been extended and altered often over the years, with the current doors added as recently as the 1930’s, so that different aspects of the building reflect various periods in Galway’s history. You can have a look inside during banking hours and there is a series of panels there which tell the story of the castle through all its changes. 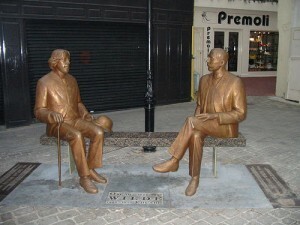 As you continue down Shop St, you can’t miss the statue of Oscar Wilde, sitting on a bench in conversation with Estonian writer Eduard Wilde. This is one of a pair of identical statues – the other one stands in Tartu in Estonia – and was presented to Galway to mark the occasion of Estonia joining the EU in 2004. Though they share a surname the two men are unrelated and never actually met or chatted in real life, though they were contemporaries. Towards the end of Shop St down a side street on the right is the 14th century Collegiate Church of St Nicholas of Myra, built from Connemara Marble and local limestone and named for the saint otherwise known as Santa Claus. The church has served its congregation, at some times Catholic, at others (as now) Protestant, for more than 650 years. The only interruption to this came in 1652 when Cromwell’s forces seized the church and used it for a time as stabling for horses. The one time importance of Galway as a trading centre is evident from the tombs in the church which have symbols of trades included in their decoration – with a stone mason, a wool merchant and a goldsmith among them. If you are in Galway on a Saturday the area outside the church will be a hive of activity as a weekly market takes place there. This is a good market with a lot of locally produced food and crafts and it’s well worth pausing for a rummage. Just outside St Nicholas Church, this rather ghoulish panel appears below a window in the only remaining wall of a building that was once another home of the Lynch family. The story goes that in 1493 Walter, son of the serving mayor James Lynch, was found guilty of murdering a Spaniard and sentenced to death. However he was a popular and well regarded figure locally, few believed him guilty and nobody willing to carry out the sentence could be found. Determined that the rule of law would prevail, James Lynch hung his own son at this spot. This act is said to have given the English language the expression ‘to Lynch’. This small unremarkable house at No. 8 Bowling Green was the home of Nora Barnacle, wife of the famous Irish writer James Joyce. It has been nicely restored and not only has some interesting material relating the Nora and her husband but is an interesting glimpse into how an ordinary working family in Galway lived during the early part of the 20th century. The house is not always open outside the high season and opening times are unpredictable the rest of the time, but if possible do go in for a look around. Your walk to the next point on the tour takes you though a street, Newtownsmith, which has undergone extensive rebuilding in recent years. It was once the location of a large mill and an important industrial area in the 19th century. All that remains now is a plaque on the facade of a building marking the location of the old mill. 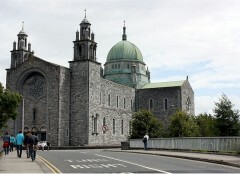 Galway Cathedral, completed in 1965 and built of local Galway limestone, is something of an architectural oddity. It mixes several architectural styles, with a Renaissance influence to the fore, a Gothic style to the arches in the nave, a Spanish look to the side aisles and a Romaneque tower to top things off. Yet it somehow works. There is some very interesting art in the Cathedral, which is something of a repository for ecclesiastical art over the last 40-50 years in Ireland and well worth visiting. There is also a magnificent pipe organ and if you happen (or plan) to visit while there is a mass on you may be lucky enough to hear it in full voice. On leaving the Cathedral you can walk to the next point of the tour via a part of Galway City known as Nun’s Island, so named because it was given by Galway Corporation to the Poor Clares, an order of nuns, in 1649. The Poor Clares convent is still there, but it is an enclosed order so the building is not open to the public. Quay St has many small craft shops and restaurants and also two famous pubs, The Quay’s which is famed for its traditional music sessions and Tigh Neachtain, where the old interior with its little ‘snugs’ or booths is a real beauty. Both pubs serve very good lunches and are noted for their seafood – so a good plan would be to aim to reach this point on the tour at lunchtime. Once an old and run down area this is now a modernised and trendy part of town, though some not very attractive new development takes away from the look of the area. 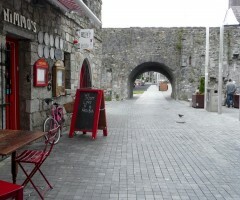 You’ll pass the Galway City Museumas you walk to the Spanish Arch – it’s worth a quick visit. The arch was built in 1584, to give access to an extension to the Quays known, still, as The Long Walk. The origin of its name is something of a mystery, though it was probably named for the Spanish traders who frequently used the harbour. Galway had very extensive trading links with Spain for many centuries and a Spanish influence can been seen in quite a few buildings around the city. It’s even said that the dark haired, blue-eyed Galway Girl of the song by Steve Earles (who lived for some time in Galway) and the many in the area who share her colouring, owe their looks to the ‘influence’ of Spanish sailors! The song opens with the line ‘I took a stroll by the old Long Walk..’ and is performed below by Irish singer Mundy with the inimitable Sharon Shannon on accordion, accompanied by a lot of people having a very, very good time in Dolans in Limerick. Watch out for those Galway girls! The area known as The Claddagh, from the Irish ‘An Cladach‘ which means ‘flat stony shore‘, sadly no longer has any visible trace of its interesting past. The area was settled originally when the occupants of the city were driven there by Norman forces in Medieval times. They fiercely maintained their traditional culture through the centuries, maintaining their own customs and dress, laws and language and even had their own ‘king’, the last of whom died in the 1950’s. Until relatively recently, up to the 1970s, it was not unusual to see ‘citizens’ of the Claddagh in the city wearing their traditional black dress and shawls. In 1937 the old thatched cottages and buildings around the harbour were demolished and their occupants dispersed to various places around the city, breaking up this centuries old community. Modern housing was built, sadly leaving nothing of the Claddagh’s proud past. Still, it’s a nice place for a walk by the Claddagh Basin, a stretch of water that is famous for its resident mute swans. 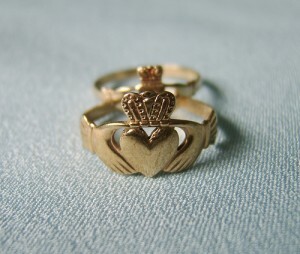 This well known style of ring has three motifs, symbolising Friendship (the hands), Love (the heart) and Fidelity (the crown). Traditionally if worn with the crown towards the fingers it means that the wearer was married, if worn the other way it signifies the wearer’s availability for matrimony. More about the Claddagh Ring and where to buy one in Galway here. This long pier stretches out into Galway Bay and is a favourite walking route for Galway residents. 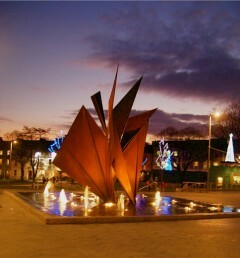 The park along side is regularly used for special events, concerts and so on during Galway’s many festival. Not everyone will want to add this extra walk, but it is a very enjoyable one. 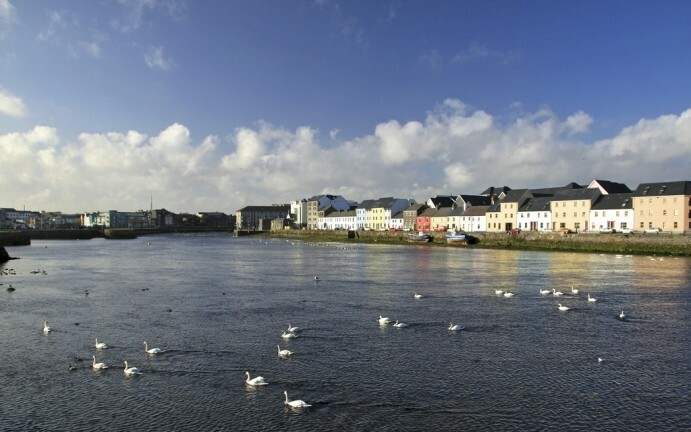 Apart from great views across the Claddagh Basin and out to sea, it is a favoured spot for bird watchers, with many species of gull especially making regular appearances and a few swans almost always waiting to be photographed! 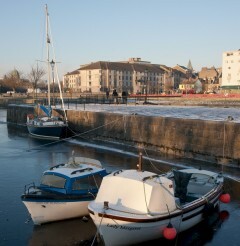 The pier is named after Alexander Nimmo, a Scottish Engineer who spent most of his working life in Galway. From 1821 until shortly before his death in 1832 he was responsible for building of government funded roads and piers throughout Galway and many other parts of the west of Ireland. With pretty much complete autonomy to decide where roads went and where piers were built, he had the power to decide which towns would grow and prosper and how the area would be traversed. As a result his influence extends down the years into every aspect of life in the region today. Please note: I do not offer walking tours of Galway – but keep getting emails from people wanting to book one!! This itinerary is a self-guided one for you to carry with you or print and follow yourself. 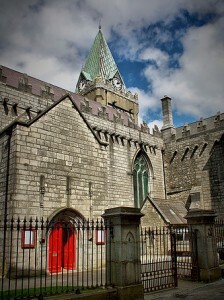 If you want a guided tour you could try Walking Tours Galway. Clifden: Not changed at all? You haven’t mentioned Crane’s Bar, the most authentic in Galway and the home of great traditional music most nights. 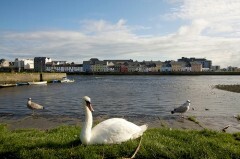 My family of 14 (8 adults, 6 children) is interested in a walking tour of Galway on Tuesday, June 18, 2013, at 1:30-2 pm. I noticed that most tours begin on June 24. Is there any way we can arrange a tour on June 18?